Welcome into my kitchen for December’s IMK. “In My Kitchen” is hosted by Sherry at Sherry’s Pickings. It’s a great way to sneak peeks into kitchens around the world. Here’s what was going on in our kitchen during November and what’s to come in December. A couple of weeks before Thanksgiving, the in-laws visited. 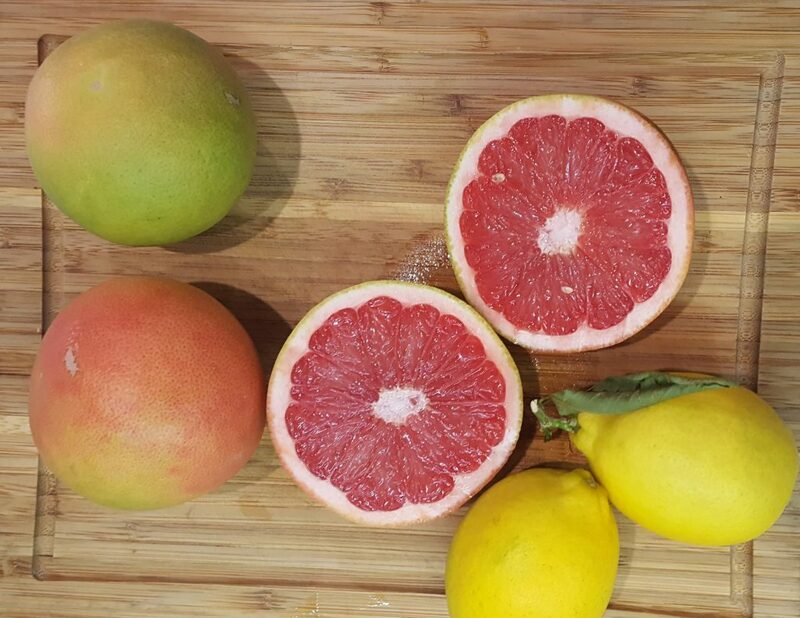 They brought homegrown citrus from their south Texas backyard: Meyer lemons and grapefruits. While my MiL was here, we picked the very last of the peppers from the garden before they froze. 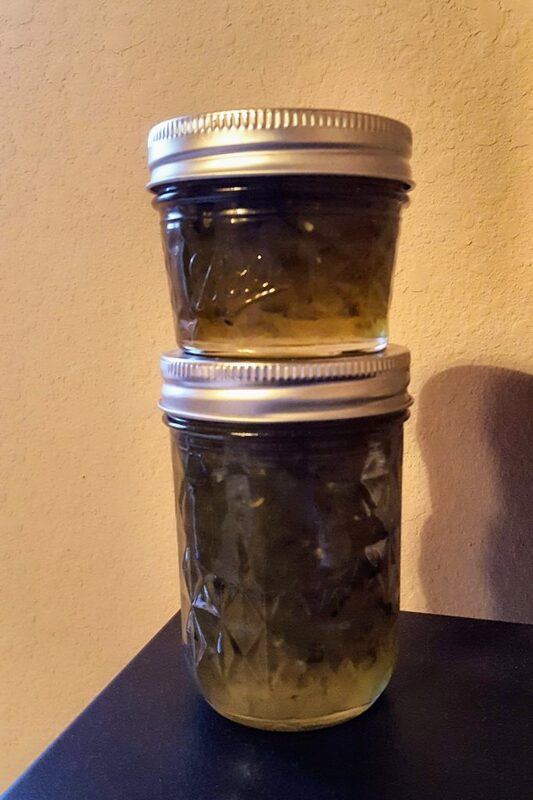 We used the bounty to make one last batch of jalapeno jelly. Loved the natural color this has. Mom knows my love of Junior League cookbooks so when she was in Tucson last spring, she picked up one for my birthday. It’s another great one. 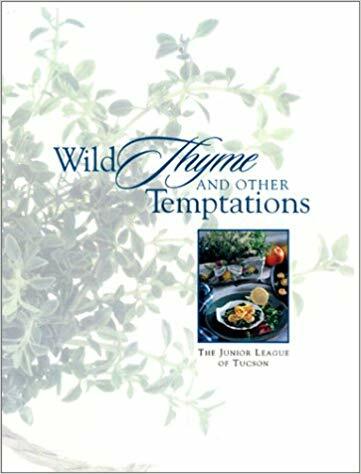 I like how it includes the history of Tucson interspersed throughout along with extra mini-recipes like “Quick Frozen Margaritas” and “Dill Popovers.” As with a lot of JL cookbooks, there are pre-planned menus like “Sunset Cocktail Soiree,” “Holiday Dinner Party,” and “Brunch for Fore.” I have a few recipes tagged like “Lentil and Sausage Soup,” “Spicy Tomato Soup,” and “New Mexican Quiche.” During the recent Thanksgiving gathering, I made “Smoked Black Bean and Corn Spread” which was a hit. This is a great make ahead dish. Fry the bacon in a skillet until crisp. Remove the bacon to drain and pour off all but 2-4 tablespoons of the drippings; set bacon aside. Add the onion to the skillet and saute until golden brown. Add the garlic and saute until tender. Add the bacon and 1 can of the beans. Rinse the bean can with 1/4 c. of the water and add to the skillet. Puree the remaining beans with the remaining 1/4 c. water in a blender or food processor. Add to the skillet with the vinegar, pepper and cumin. Bring to a boil and reduce the heat. Simmer for 15 minutes or until thickened. Preheat oven to 350 F.
Spread the mixture on a heatproof serving dish. 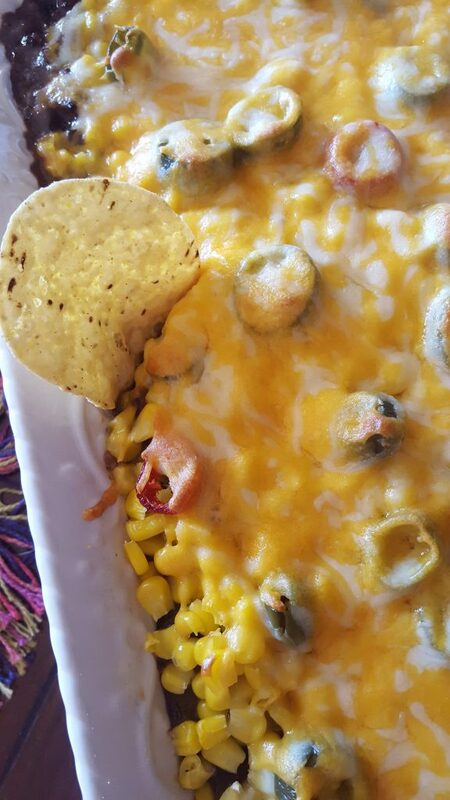 Spread the corn over the top and sprinkle with the cheese. Heat in oven until cheese melts (about 15 minutes). Serve with tortilla chips. Mom and Sis basically whipped this recipe up for me as I made dinner one night. They included the cumin and I included the jalapenos before baking. It was a family affair! I recommend this dip for your holiday buffet or seasonal gathering. It can be thrown together ahead of time, refrigerated and then popped into the oven before serving. Another great birthday present was this pottery floral frog from my sister. It’s made to fit on top of the vase. Finally, this is our new favorite cheese. I just randomly picked it up at the cheese counter. 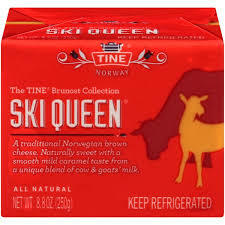 Ski Queen is a semi-soft cheese with delicious caramel overtones. It would be great melted over warm apple pie. In fact, it might be outrageously delicious if you sprinkled shreds of it onto this Insanely Good Apple pie instead of the caramel. Obviously, I’m linking up with December’s IMK. For all my IMK posts, click here. I am also linking up to Foodies Read for December (for the brief cookbook review). As you can see, there’s no real theme this year, just a hodge-podge of homemade goodies and gifts. And, this post is turning into a bit of a hodge-podge as well today. 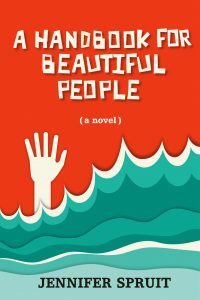 There’s a giveaway on Amazon (hosted by the author) for A Handbook for Beautiful People by Jennifer Spruit. I reviewed the book here. Treat herself for a possible early holiday present and enter the giveaway. The dip looks like a much more wonderful and home-made version of the Trader Joe corn and bean salsa/Cowboy Caviar. So delicious looking! I love the flower-arranging device — pretty colors! The dip looks so good! And I love pottery floral frog from your sister. Really cool. It’s really unique. She finds the coolest stuff. Black bean and corn spread? Smoked? I’m sold! That looks terrific. As does everything else in your kitchen this month. Thanks for the peek! Thanks, Sherry. Junior League is a service oriented organization in the US, UK, and Mexico. (I just looked it up.) My sister told me over the holidays that I have so many of these types of cookbooks that I should write a book about them. I think I will definitely write a post about them (someday). Wish I could dig into that dip right now! Yum!!! I love Tucson and love Junior League cookbooks so have to get this one. And to have your own citrus trees like your in-laws that’s the best. Nice flower arrangement too, definitely unique. Thanks, Pam. Someday I will post all my JL books and how many I actually have. It might be scary. I’ve never heard of Junior League cookbooks but that this is from Tucson made me feel nostalgic for home. I grew up in Phoenix but spent lots of time in Tucson with my grandparents. It’s such an interesting part of the world. Merry Christmas! We’ve only been to Tucson once for a graduation. I would love to spend more time there. What a lot of interesting things in your kitchen, I also love Junior League cookbooks and that dip looks like a winner. I’m pinning it for a New Year’s Day buffet although I may leave out the bacon for the vegetarians. Love the frog, wonderful idea to put it on top of a vase. And I am going to check out your cookbook club. I use to belong to a virtual one but it ended. I really enjoyed and miss it. Happy holidays, I’ll be looking out for your dog biscuit recipe. The pups need Christmas as well. Thanks for another peak into your kitchen. I love the frog vase! The black bean dip also looks fabulous. We could make a meal out of this. I just might have! 🙂 The leftovers were great! Happy Birthday Debra, it sounds as if it were perfect. 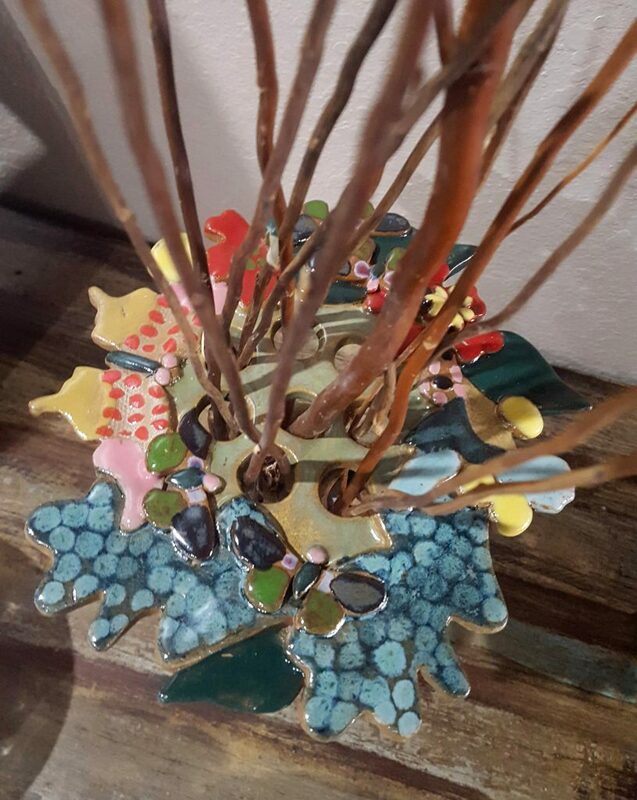 Debra, the flower frog vase topper looks like a bouquet in itself — what a pretty way to manage your posies! (Belated birthday wishes, xo.) Nice to know a local artist was supported, too. 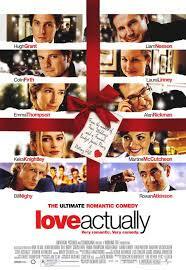 I just watched Love Actually last night — such an upbeat, feel-good movie. If only I’d had a plateful of your black bean dip… 🙂 Loved your family affair recipe revisions and all the creative things you have going on, too. Merry Christmas! People either love or hate that film. I love it! Hope your holiday was Merry and Bright!